"Zita shows you how preparing for pregnancy and good nutrition is one of the most important investments you can make towards the health of your baby. I love to cook and the recipes in this book are great." "Fertility guru Zita West has helped some very A-list mamas over her 36-year career as a midwife, including Kate Winslet and Gwyneth Paltrow. Out of her central London clinic, West boosts chances of conception through medicine and also by improving her clients' overall health. 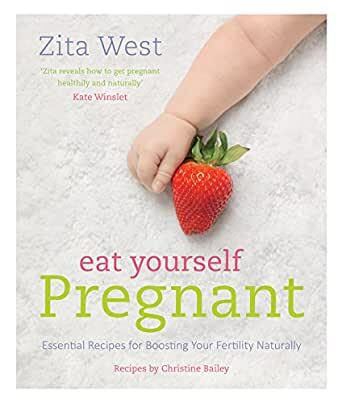 And for those of us who can't afford her pricey private fees, the good news is that her new cookbook, Eat Yourself Pregnant, provides a snapshot of her philosophies as well as a comprehensive look at what you should eat - and avoid - to boost your fertility." I've started acupuncture and herbal treatment for fertility and was looking for a book to give me some recipes to help me add more variety to my diet ( getting bored with stir fry). There are only a few acid-alkaline recipes and they are only ok - most recipes are pretty complex and not family friendly. Kinda wishing I wouldn't have bought this book. Worthless book - save your money.